I had an hour and a half layover today in Phoenix, NM, and as I arrived to the connecting gate, I saw that the area was completely packed. All the chairs in the seating area were taken and the few electrical outlets were all occupied, and there were several people sitting on the floor. There were kids crying and it was overall pretty chaotic. I needed to get some work done and this was not what I was looking for. Fortunately, there happened to be a US Airways club right above my gate that I had access to with my Priority Pass membership from my American Express Platinum. It was a godsend to have a nice couch to sit on, free snacks and cocktails, and peace and quiet. At all the lounges, they give you a free wifi access code that works for 24 hours. 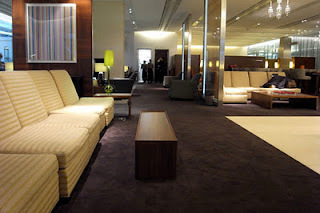 With the amount of traveling I'm doing these days, I've been able to utilize the lounges more and more!